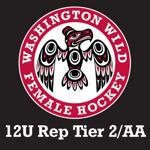 WWFHA proudly announces the selection of Anne-Marie Dion, Jason Goscinski, and Jim Cerenzia as the Washington Wild 12U Rep Tier 2/AA coaching staff for the 2018 – 2019 season. The 12UAA Rep team includes players of the highest skill (AAA and AA levels) from the Seattle and surrounding area, with the primary goal of skill development and advancement to the next level, including advancement through the WWFHA system and eventually collegiate play. Coach Anne-Marie Dion grew up in LaGrange, NY, where she started playing hockey at the age of 10. During her career, she played for both house and travel teams in New England, before attending the Berkshire School in Sheffield, MA, where she participated as a member of the varsity hockey team. Subsequently, Coach Dion attended Northeastern University in Boston, MA, where she played for the non-varsity team (American Collegiate Hockey Association [ACHA] Women's D1). The starting goaltender for her final three years, she earned a spot on the ECWHL First-Team for her play over the course of her senior season. A two-sport athlete, she also played for the club lacrosse team while at Northeastern. Coach Dion’s coaching experience includes many camps and clinics over the years, including the Pro Ambitions camps, Boston Bruins FUNdamentals, and the NY Rangers Learn to Skate program. She also worked an internship with the Boston Bruins as a Youth Hockey Development Intern over the course of five months. Recent coaching activity includes coaching girls’ lacrosse, including the Queen Anne Quick Styx here in Seattle and Learn to Row for Lake Union Crew. Coach Dion coached the inaugural Washington Wild 8U travel team travel team during the 2016 - 2017 season, and served as 19UAA assistant coach under Shaun Miller in the 2017-2018 season. She holds a USA Hockey Level 3 coaching certification and a Hockey Canada Development 1 certification. Coach Jason Goscinski has coached three years with the Washington Wild 10U team, and holds a USA Hockey Level 3 coaching certification. He started coaching beginners and the 8U age group five years ago for both SKAHA and WWFHA’s Washington Wild. Coach Goscinski helped lead the 8U Seattle IceHawks Girl’s Tournament Team in 2014 – 2015 followed by coaching the Washington Wild 8U Tournament Team for the past three seasons. Coach Goscinski served as the on-ice coaching lead for WWFHA’s beginner program last season, which boasts 40-60 players each session. Jason participates regularly in games with local adult hockey leagues. Jim Cerenzia grew up playing hockey in London, Ontario. He has coached teams at ages 5-16 in Northern Virginia and Bozeman, Montana, including the inaugural 14U girls’ team in Bozeman. He has a Level 3 USA Hockey certification. He focuses on individual skill development and intensity of play. Visit the website to register for tryouts today!